Specifically engineered to give you the lifestyle you want – freedom to go where you want, when you want, without waiting or hassles – and to do it with advanced technological innovation, exhilarating performance and unprecedented style. Make your life possible. 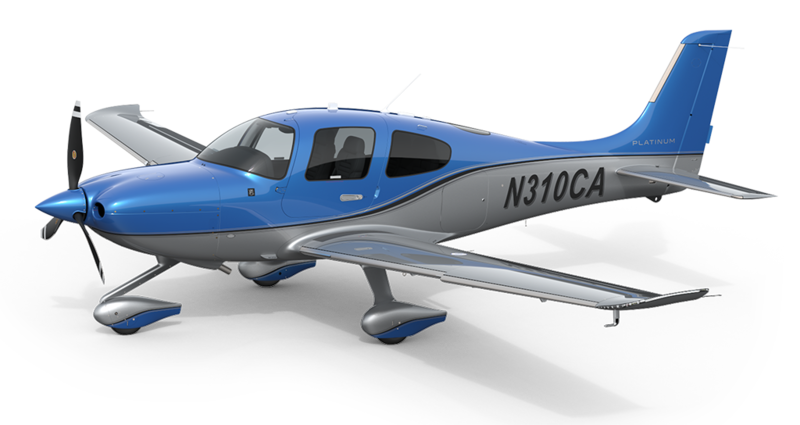 For 17 years and counting, the SR22 series has been the best selling aircraft in its class. 406 MHz ELT FliteCharts® & SafeTaxi® *US only. Subscription required. 3 day Transition Training Package 1Available for US only; ADS-B In Weather and Traffic not included on export aircraft. Bring must-have jet features to your Cirrus SR Series aircraft. Yaw Damper provides cruising comfort for pilot and passengers, reduces pilot workload and enables true three-axis autopilot functionality. The Enhanced Vision System (EVS) leverages infrared imaging technology to display what the human eye cannot see. Gain peace of mind in night and low-visibility conditions knowing cloud tops & build-ups, surrounding terrain, runway obstacles, taxiways and surface markings are clearly visible on the MFD. Get the complete picture. Active Traffic enhances the standard ADS-B In Traffic with active interrogation of nearby transponder equipped aircraft to create a 360° zone of detection and awareness around the aircraft and provides visual and ATC-like audio alerts to potential traffic hazards. eTAWS TAWS-B terrain warning system calculates predictive terrain avoidance guidance based on your flight path, visually and aurally alerting the pilot if terrain threats loom ahead. Upgrade to 12” screens for tremendous situational awareness and 35% more screen real estate over the standard 10” screens. Always know where you are on approach or on the airport itself with ChartView (geo-referenced Jeppesen published electronic charts) and one year of navigation data subscriptions. SurfaceWatch™ monitors your aircraft’s position on the ground providing enhanced situational awareness through aural and visual alerts to the pilot throughout the airport terminal environment. Increase your flying flexibility and capability with the Cirrus Known Ice Protection System. Not an STC or an afterthought, this TKS-based system was uniquely engineered to include innovative features such as dual windshield sprayers that ensure landing visibility, dual TKS fluid tanks with automatic tank switching and three TKS flow rate options to cover every condition. More impressive is the full integration with the Cirrus Perspective cockpit providing ready access to TKS fluid duration and range information and all System Operating Parameters. Finally, this package also guarantees your aircraft is ready for colder weather flying and maximized engine life with a Tanis Avionics & Engine Pre-Heater. The Carbon, Platinum and Rhodium design suites ensure that you’ll arrive in comfort and style, no matter where your Cirrus takes you. Premium leather and bolstered seats maximize cruising comfort, and striking exterior designs reflect your personality on the ramp. Inspired by the unmistakable style of the most legendary sports cars, the Carbon Appearance design suite utilizes a new palette of colors that delivers a stunning tarmac presence. Interior details such as jet black vents, carbon fiber instrument panel lobes and two tone premium leather bolstered seats complete this exhilarating look. A true sense of traditional, elegant and luxurious style is captured in the Platinum Appearance design suite. Fluid lines and a distinguished collection of earthy exterior colors highlight this desirable option. Nickel vents, a painted spinner, and solid color premium leather bolstered seats provide the perfect finishing touches to complement this stylish aesthetic. Timeless and sophisticated, the Rhodium Appearance design suite defines modern luxury with iconic simplicity. Make your statement with a striking yet subtle exterior in one of three stunning metallic hues. Nickel vents, a painted spinner, and solid color premium leather bolstered seats provide the perfect finishing touches that complement this rich Cirrus style. The GTS is truly the SR22T flagship. Combine all the packages for even greater value: Cirrus Executive, Cirrus Awareness, Cirrus Advantage, Certified Flight into Known Ice, Carbon/Platinum/Rhodium Appearance and authentic GTS badging. GTS is the luxury, technology and performance standard by which all other aircraft are measured. Stay cool with this factory installed Air Conditioning System. Worldwide weather, satellite phone and text messaging through Iridium Communications, fully integrated for use with your cabin headphones means you’re always within reach. Enhance weather awareness with instantaneous lightning information for all types of convective activity. Guarantee your aircraft is ready for colder weather flying and maximize your engine life. Also included in the Certified Flight into Known Ice Package. Add two more years for an unprecedented and industry-leading 5 year / 2000 hour Spinner-to-Tail warranty. The most complete coverage for the world’s most desired aircraft. Cirrus owners already have an unparalleled appreciation and expectation for quality and performance. It’s the reason Cirrus continues to be the world’s best-selling airplane in its class. Now, Xi takes this one step further through individualization – by making you an integral part of the design team for your dream airplane. A unique experience worthy of every flight you will make in your Cirrus, you will develop a personal working relationship with the Xi Team, working one-on-one to tailor your plane to your exact specifications and preferences for materials, colors, designs and more. With Xi, you define the art of the possible. Xi makes you an integral part of the design team for your dream aircraft. You will develop a personal working relationship with a Xi Specialist, working one on one to tailor your Cirrus to your exact specifications. Xi customers will be invited to join us at Cirrus Headquarters in Duluth, Minnesota. Here you will meet face to face with your Specialist in the Xi Studio to make important design decisions and become a part of the Cirrus culture at work.